Last week I introduced you to my latest project- Stone Manor Airbnb Home. It needed very little work- just some paint, staging, and deep cleaning. I spent the weekend fast & furiously prepping this cutie house for her debut. As I’ve mentioned before, the initial costs associated with opening an Airbnb can be intense, but I shopped around online and several (SEVERAL) thrift stores to stage this home. I also purchased several items from the previous owner to help with costs and convenience. After a long weekend of work, Stone Manor Airbnb is officially open for business! Except for some de-cluttering, I did absolutely nothing to the exterior. It’s in great shape and just so charming. 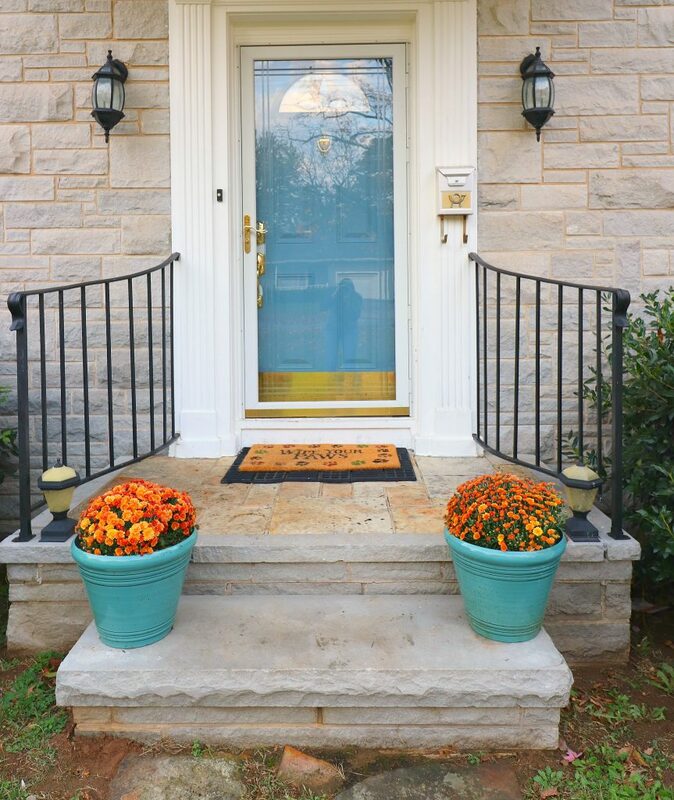 On its own, the curb appeal is just stunning! 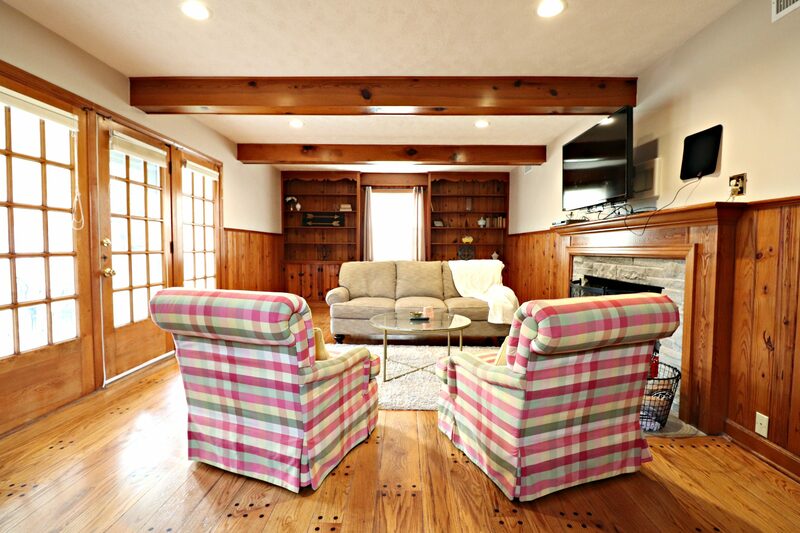 This home is located on a tree line street and nestled among many other historic homes. There are no cookie cutter homes in the historic district. That’s obviously what I love about it most– and I hope my guests will too! 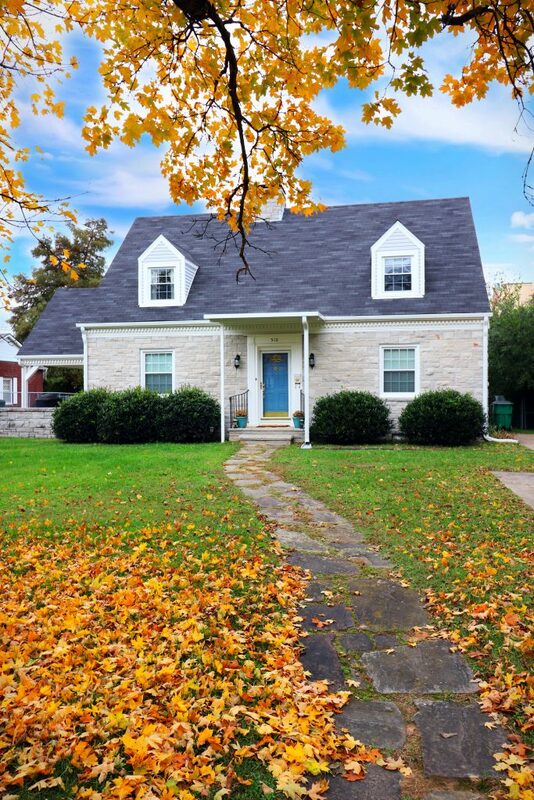 As a reminder, this home has 3 bedrooms, a claw foot tub, original wood floors, two levels, and an amazingly spacious side porch. It’s located in the historic district just steps from bike paths, cafes, pubs, museums, theaters, and so much more! As with the Cozy Cottage Airbnb, its location is the selling point! I scored a lot of the furniture second-hand for this Airbnb. I’m extremely selective when I’m purchasing furniture second hand, and I got very lucky! I purchased the couch from a retired couple that was downsizing from their $775,000 home. I scored the plaid accent chairs at Goodwill for $40 each! And they are incredibly comfortable! You may recognize the coffee table from Flip 5! It’s an Amazon score for $75. The plush carpet was a Facebook Marketplace score for around $30. And the super soft fringed throw blanket was a Sam’s Club find for $15. I think I did relatively well on the spending in this room! I spent basically no money in the dining room! The first thing I did was to paint over the sunshine yellow walls! The vintage Ethan Allen trestle table was my parents’ first furniture purchase when they got married over 40 years ago. I accented with a tablecloth from Hobby Lobby, some thrift store placemats, some old curtains from Flip 3 sunroom, and a leftover basket with pine cones from my parents’ farm. I get so proud of myself when I can stage a room for basically no money! 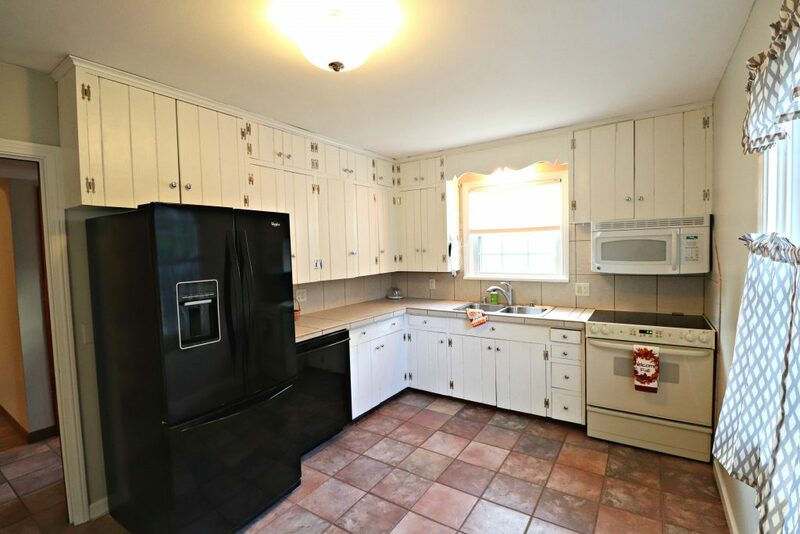 If you checked out my post with the before pictures, you may remember that the kitchen had very, very bold lime green walls. My first order of business was taming the wild wall color, so I used my staple gray to give the room a calmer feel. 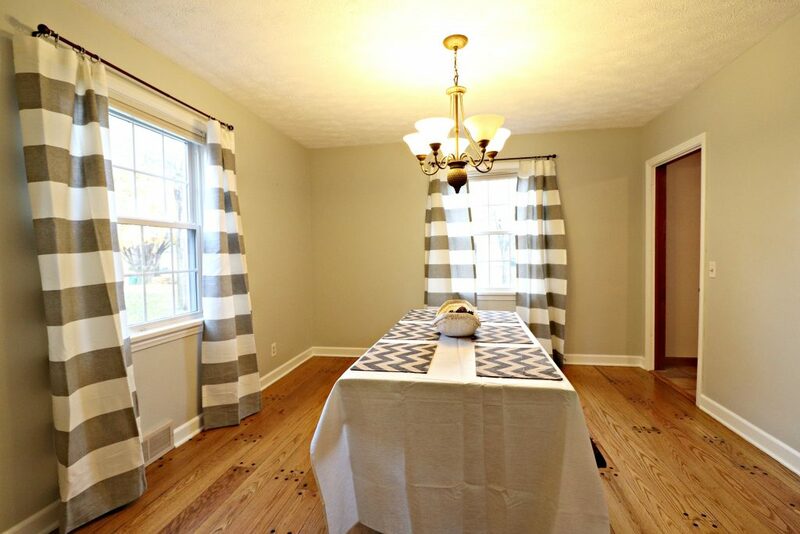 I picked up some inexpensive bistro curtains from Walmart for privacy, and that’s all I had to do in this room! 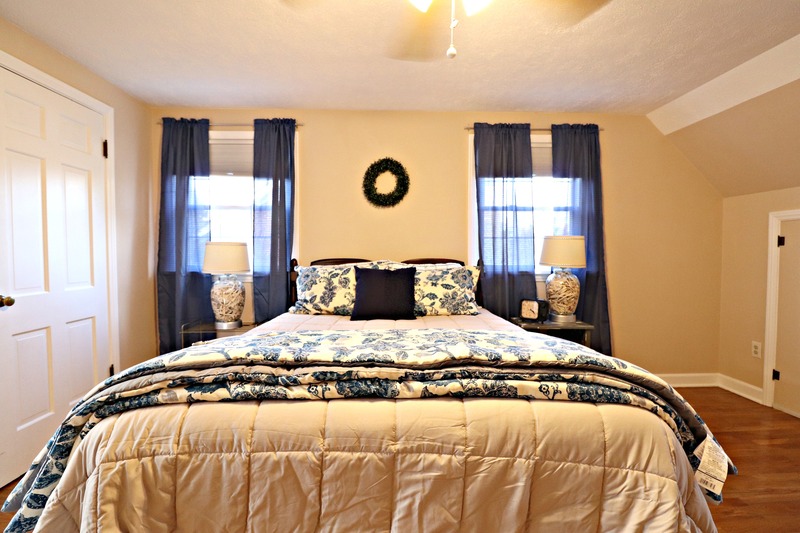 I wanted each of the three bedrooms to have a different style but still feel relaxing and cozy. The largest of the bedrooms just needed some new linens and curtains! The bedding set was a $25 Walmart clearance find, and I picked up the side table at one of my favorite vintage stores. I found the unique lamps (they’re full of shredded books!) on Facebook Marketplace for $35. I accented the walls with some TJ Maxx clearance art and some Walmart curtains. 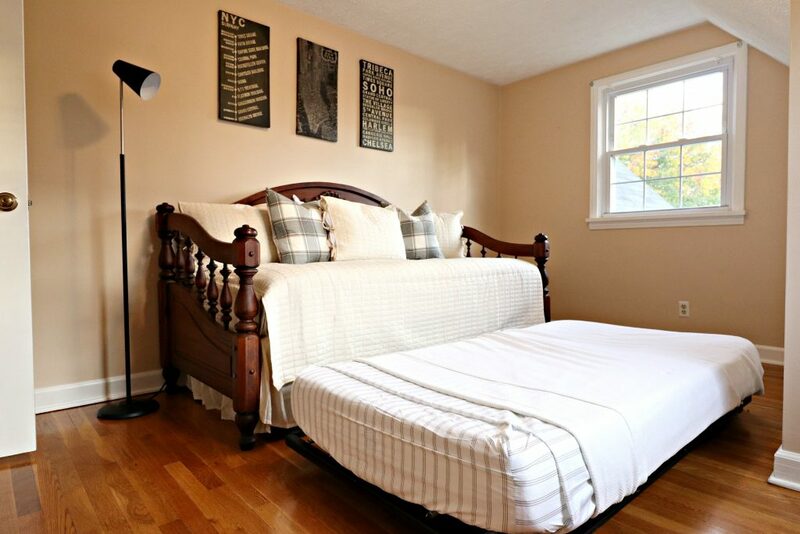 I purchased the daybed from the previous owners, but I wanted to increase my sleeping capacity, so I scored a trundle bed from Facebook Marketplace and then I ordered my favorite memory foam mattress from Wayfair. I picked up the bedding and sheets on Amazon, and the lamp was a $20 Walmart clearance find. I’m calling this room the “New York Room” because I stumbled on some New York art at Salvation Army for $4, so I clearly went with that theme! 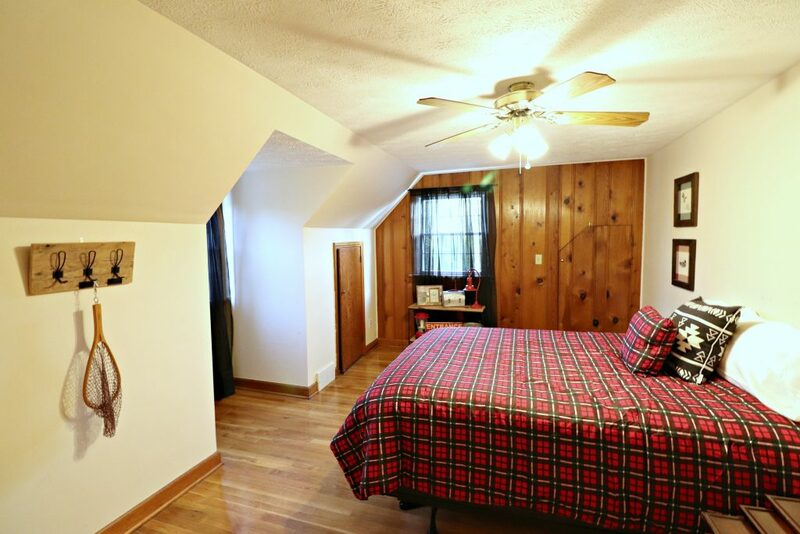 The second I saw this room, I knew it had a lodge feel to it because of the wood paneling. The “Lodge Room” is staged with fishing and cabin decor that I scored mostly second-hand. I found the plaid bedding set at a local grocery store for $30! From Ebay to Facebook Marketplace, I spent less than $75 decorating this room with art, decor, and tables! One of my first projects to tackle in the near future is to add a wood accent shiplap wall to create a “headboard” behind the bed. 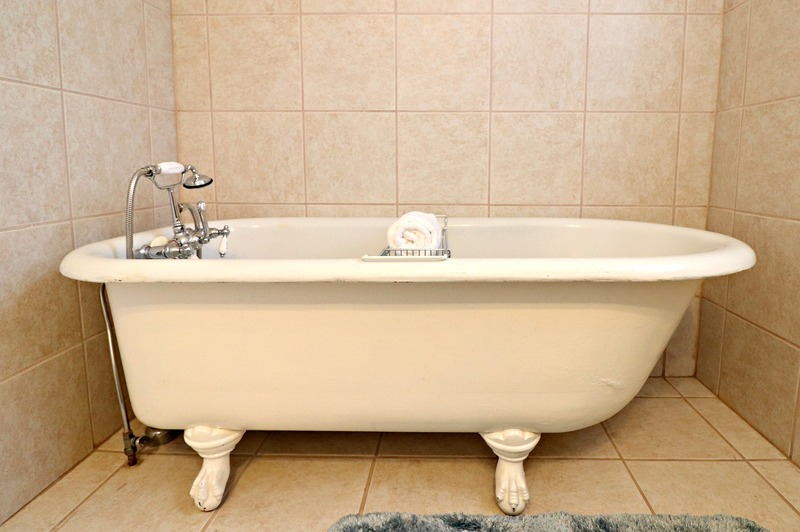 I think one feature my guests are going to LOVE is the original claw foot tub! Can’t you imagine soaking for hours in a hot bubble bath after a long day of exploring? Since the bathroom situation is limited at this house (only 1.75 bathrooms), I hope guests will find this little gem to be an asset. 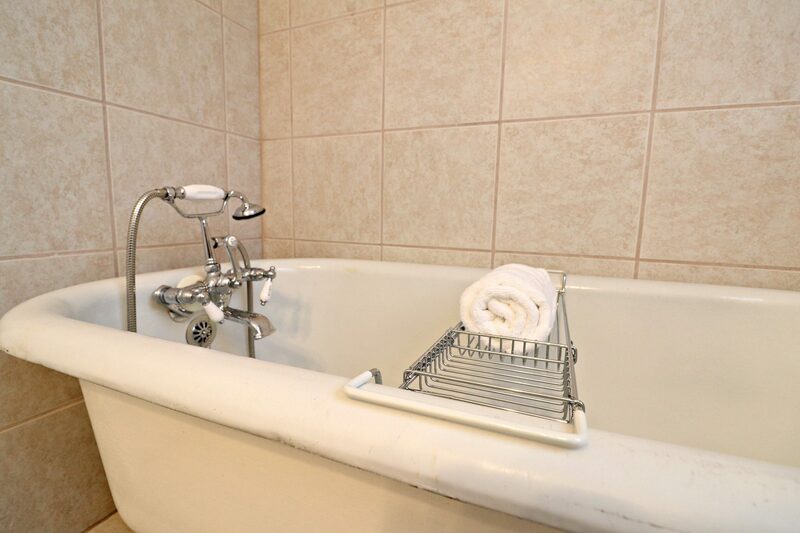 I’ll provide some bubble bath for guests to utilize during their stay. Another project I’m contemplating is painting the front door. I really love the idea of a bright red door since the house is so traditional. But for now, I’m leaving the existing blue. I picked up some $2 clearance mums at Lowe’s, and Stone Manor Airbnb is officially open for business! 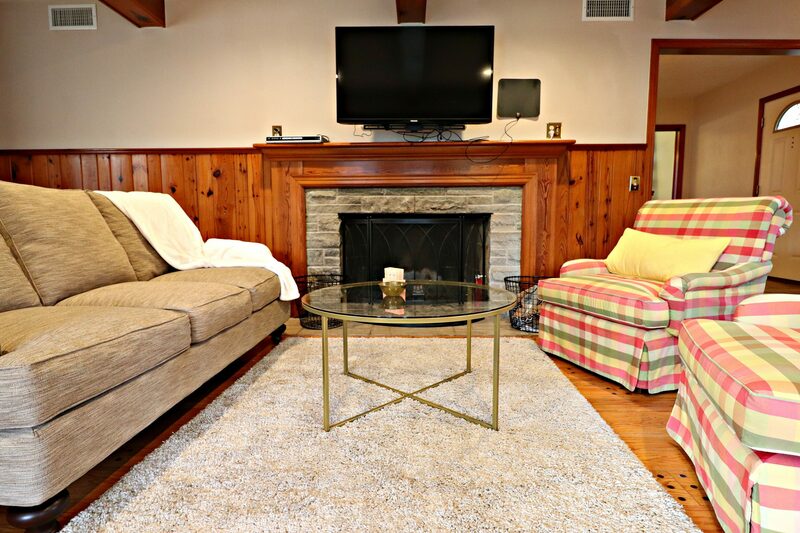 Whether you choose Airbnb or VRBO, Stone Manor is available for bookings. 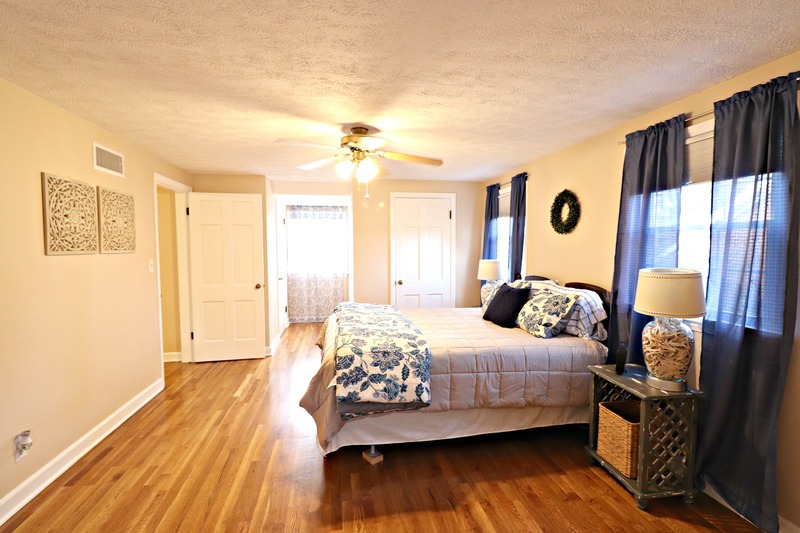 Simply click the Airbnb link here or the VRBO link here. If you’ve never been to Northwest Arkansas, add it to your bucket list to see the home of Walmart, University of Arkansas, Crystal Bridges, and more! You did a fantastic job. This truly inspires me to list my property. Yay! Thank you! And you should do it!